ArtisTree added 104-inch mowers to reduce manpower needs. Landscape companies used to be able to solve problems by “throwing labor at it.” If you were behind on a project and the client was unhappy, you could add another crew or work weekends to hit your timeline and please your customer without doing too much damage to your bottom line, says Jason New, principal with landscape coaching firm McFarlin Stanford. That changed during the Great Recession, when there simply wasn’t enough revenue to “throw labor” at problems. Over the last few years, the scarcity of labor and increased labor rates reaffirm that it’s unfeasible to solve problems this way anymore. So how should companies improve production? Experts say it’s essential for landscape companies to be more efficient in everything they do. It’s time to become efficiency hackers. How? Efficiency starts with budgeting for everything, New says, noting many companies have budgets for individual jobs, but they don’t have budgets for contingency items like travel time, shop time, equipment maintenance and warranty work. Next, companies should determine where they could make the biggest impact and focus on honing those processes. Finally, and most importantly, involve your team members. 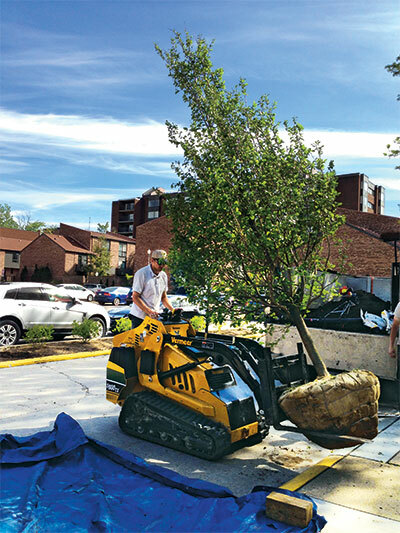 In addition to talking with New, we checked in with several landscape companies to learn about the clever solutions they’re using to become more efficient. Sometimes, an efficient solution to a problem can be as simple as a smart equipment upgrade. The operations department at ArtisTree went this route about two years ago when it acquired two Hustler Super 104s after being introduced to these 104-inch, wide-area zero-turn mowers by its equipment dealer. The company, which did about $18.8 million in revenue in 2017, always has owned mowers in a variety of sizes: 52-inch, 61-inch and 72-inch. Plus, it’s operated several 11-foot-wide bat-wing mowers, although those weren’t suitable for the homeowner association clients that make up much of ArtisTree’s portfolio. “A bat-wing is not really a finish-cut mower—it’s more of an open-field mower, and that’s what we always used it for,” Walters says. To decide if the 104-inch mower would be a good fit, the ArtisTree operations team first demoed one to evaluate the labor savings. “Inevitably, just in pure man-hours, we were saving about eight hours a day,” Walters says. The company sees additional savings from reduced labor needs, such as workers’ comp costs, and decreased transportation costs. The company initially purchased two of these machines and is now up to four between two locations. “So four guys are doing the work of eight,” he says. Because the 104s are a finish-cut mower with a mulch kit capability like a typical zero-turn, they’re a good fit for ArtisTree’s properties, many of which are residential communities’ common areas, backyards and around community retention lakes. ArtisTree typically runs six-man mowing crews with three standard mowers. 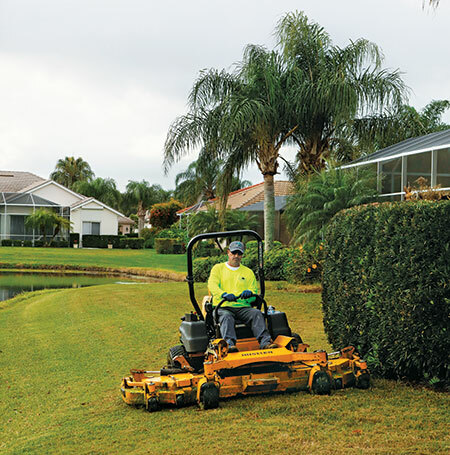 The 104-inch mowers are operated as independent one-man crews, moving ahead of the six-man crews throughout a property. The 104-inch mower costs north of $20,000—more than double the price of a typical 52-inch mower ArtisTree would purchase. But they’re cheaper than a bat-wing mower, which Walters estimates to be around $60,000. Because ArtisTree already had team members trained to mow around lakes with the bat-wing mowers, the transition to the 104s was easy, Walters says. The company’s existing trailers also could be used because the sides of the 104s fold up to an 80-inch-wide transportation size. “For the time saved and the other costs associated with not hiring another person, the savings far outweigh the costs,” he says. 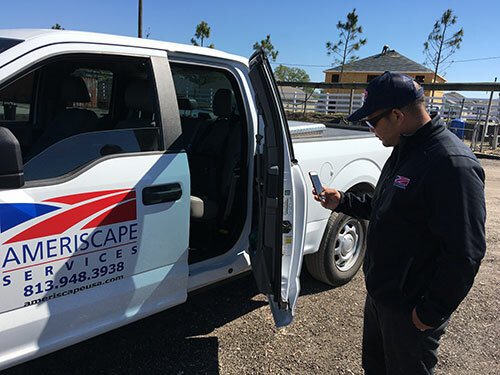 Ameriscape’s equipment features scannable QR codes that link to its repair history and other data. When Tony Canorro joined Ameriscape as fleet manager late last year, he knew he wanted to apply an aggressive,operational-minded approach to the role. He oversees all of the company’s equipment and vehicles with the support of two full-time mechanics and a part-time helper. The company, which did about $12 million in 2017 revenue, had been using a standalone GPS system to track vehicles and a spreadsheet to log equipment repairs, but he wanted a system that served as a “patient chart” for every piece of equipment. After some research, he landed on a system called Tenna which provides both asset management and GPS capabilities. All trucks and machines now have a QR code that can be scanned with a mobile device. Here’s how it works. When a foreman has a problem with a mower, for example, he scans the equipment’s QR code with the app on his phone and enters notes about his concerns. The fleet team can immediately access this information and assess the problem quickly—and mechanics can even order parts upfront if needed. Though he declined to provide specific costs, Canorro says he’s paying less for the system’s asset tracking and GPS functions than he previously paid for GPS alone from a different vendor. The system also provides a “sanity check” for the mechanics, whose observations about equipment and repair history are now memorialized in the software. Equipment and people are two of many factors that could impact revenue per man-hour. At Eichenlaub Inc., a member of the LandOpt network, the management team keeps its eye on many key performance indicators (KPIs), but one in particular serves as a barometer for efficiency: target revenue per man-hour. “It’s a lagging indicator, and it starts when we build a financial plan,” says Dan Eichenlaub, president. His company, which has 75 employees, tracks this metric by department, rather than as a whole company, due to each business area’s unique inputs. He calls revenue per man-hour a useful, “quick and dirty” gauge of productivity. The company evaluates this metric at the end of every month within a day of billing, based on revenue billed and man-hours logged. The latter comes from payroll data. For companies that are just beginning to track this information, he recommends going back through historical financial information to benchmark where it’s been in the past. It’s important to recognize this KPI doesn’t tell you if you’re making money, Eichenlaub says. You could be losing money and have a good revenue per man-hour. This metric only indicates if you have a productivity issue around your profitability. Most importantly, once you see productivity is slipping, you need to uncover why. “If that number swings 3-4 percent either way, you better go find out what the cause is,” he says. There are a variety of factors that could cause the number to fluctuate, including bad weather, insufficient training, personnel problems, equipment and more. The company has been using this metric for about 13 years, since it joined LandOpt. He said it took a few years to learn the numbers, but now he can get a report and instantly analyze whether he needs to take action based on the revenue per man-hour. There are further opportunities to leverage this metric. For example, you can use it as a gut check for every bid that goes out the door by asking, “Is the revenue per man-hour in the right place?” If it’s low, perhaps you forgot to factor in a vital input. Some companies analyze this metric for every snow event or for each crew, though Eichenlaub opts to leave it at the department level, and he incentivizes department managers for hitting their targets. Jason New shares a few ideas for companies looking to improve efficiency. Problem: There is too much downtime as commercial maintenance crew members walk back to the truck to get supplies. A 1-liter gas bottle on a lanyard in case they run out of gas. Problem: Crews often miss their budgeted hour targets. Solution: Give crews only 75 percent of the hours allotted for their jobs to allow for contingencies and punch list items. Then, if they need more time, it’s already in the budget. Problem: Crews spend a lot of indirect time handling materials. Solution: Remember the acronym OHIO—only handle it once—and work with vendors to deliver materials directly to the job site. Consider asking vendors to take a photo before delivery to ensure plants are to specification, for example. Additionally, ensure crews have a checklist of what should be delivered to prevent callbacks. Finally, to avoid excess lost time, develop a delivery policy so crews know what to do if they arrive on site and materials aren’t correct. Problem: Irrigation repair teams drive large, gas-guzzling pickup trucks. Solution: Consider a smaller vehicle, such as a Ford Transit, for irrigation maintenance technicians, and organize them in a standard way.